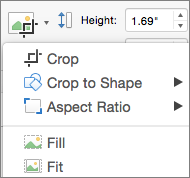 You can use the cropping tools in Office for Mac to trim and remove unwanted portions of pictures by using standard cropping, cropping to a shape, or cropping to fill a shape. Select a heading below to open it and see the detailed instructions. Use Insert > Picture to add the image to an Office file (such as a Word document, PowerPoint presentation, or an Excel workbook). Control-click the picture and select Crop. Black crop handles appear on the edges and corners of the picture. Drag the center cropping handle on that side inward. Press and hold the Shift+Option keys while you drag the center cropping handle on either side inward. Press and hold the Shift+Option keys while you drag a corner cropping handle inward. Click away from the picture to see the cropped image. Note: After you crop a picture, the cropped parts remain as part of the picture file. To permanently remove the cropped portion and reduce your picture size, see Delete cropped areas of a picture. Quickly change the shape of a picture by cropping it to a specific shape. The picture is automatically trimmed to fill the geometry of the selected shape while maintaining its proportions. If you want to crop the same picture to more than one shape, make copies of the picture and crop each to the desired shape individually. In your file, select the picture that you want to crop. On the Picture Format tab, click the arrow next to Crop. Point to Crop to Shape and then click the shape you want to crop to. The shape is immediately applied to the image. If you want to adjust the shape, click the Crop button again on the ribbon. Choose Fill to remove (or "crop") part of the picture, but still fill the entire shape. Choose Fit if you want all of the picture to fit within the shape. The original picture aspect ratio is maintained, but you may have empty space inside your shape. In your file, select the picture that you want within the shape. If you don't see the Picture Format tab, make sure that you've selected a picture (and not a shape). Click Fill or Fit, and then click outside the picture. Even after you crop parts of a picture, the cropped parts remain as part of the picture file. You can reduce the file size by removing the croppings from the picture file. This also helps prevent other people from viewing the parts of the picture that you have removed. Important: Deleting cropped areas of a picture can't be undone. Therefore, you should only do this after you are sure that you have made all the crops and changes that you want. Click the picture or pictures from which you want to delete cropped areas. On the Picture Format tab, click Compress Pictures . Select the Delete cropped areas of pictures check box. To remove croppings for the selected picture or pictures only and not all of the pictures in the file, select Selected pictures only. Click the Format Picture tab. If you don't see the Format Picture tab, make sure that you've selected a picture (and not a shape). Drag the cropping handles as needed to trim the margins of the picture, and then click outside the picture. You can position the crop by moving either the crop area (by dragging the edges of the crop rectangle), or the picture. After you crop a picture, the cropped parts remain as part of the picture file. To permanently remove the cropped portion and reduce your picture size, see Delete cropped areas of a picture. A quick way to change the shape of a picture is to crop it to a specific shape. When you crop to a specific shape, the picture is automatically trimmed to fill the geometry of the shape. The proportions of the picture are maintained. In your file, select the picture that you want to crop to a specific shape. Under Adjust, click the arrow next to Crop, point to Mask to Shape, point to a type of shape, and then click the shape that you want to crop the picture to. When you are finished, click outside the picture. Choose Crop to Fill to remove (or "crop") part of the picture, but still fill the entire shape. Choose Crop to Fit if you want all of the picture to fit within the shape. The original picture aspect ratio is maintained, but you may have empty space inside your shape. Click the picture that you want within the shape. Under Adjust, click the arrow next to Crop, click Crop to Fill or Crop to Fit, and then click outside the picture. When you are finished, press ESC. Under Adjust, click Compress, and then select the Remove cropped picture regions check box.